The Chrysler Pacifica is an award-winning minivan that is famous for its innovative and high-tech offerings. Perhaps it's no surprise that the 2018 Chrysler Pacifica offers Calgary-area drivers a hybrid powertrain. The 2018 Chrysler Pacifica Hybrid is offered in three trim levels: Touring Plus, Touring L and Limited. Each model features a 3.6-liter V6 eHybrid Engine with a 650-amp maintenance-free AGM battery. Drivers can recharge with either a 120-volt (Level I) or a 240-volt (Level II) chargers. Pacifica Hybrid models offer drivers an EPA-estimated 84 MPGe (miles per gallon equivalent), a 33-mile all-electric range and an amazing 566-mile total range. 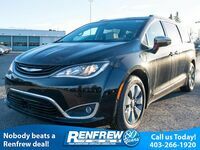 Keep reading to learn more about the new 2018 Chrysler Pacifica Hybrid at Renfrew Chrysler in Calgary, AB! The 2018 Chrysler Pacifica Hybrid is offered in three trim levels, each offering a unique set of standard and available features. Touring Plus models include a Uconnect® 4 infotainment system with an 8.4-Inch touchscreen featuring Android Auto™ and Apple CarPlay® compatibility, USB Media Hub, Easy Entry Slide second row seating, cloth low-back seats, seven-inch full-color digital driver information display and more. Touring L models include a Uconnect® 4 infotainment system with an 8.4-Inch touchscreen featuring Android Auto™ and Apple CarPlay® compatibility, ParkSense® Rear Park Assist with Stop, ParkView® Rear Back Up Camera, Remote Keyless Entry, perforated leather-trimmed seats, power liftgate and more. Limited models feature a Uconnect® 4 infotainment system with an 8.4-Inch touchscreen featuring Android Auto™ and Apple CarPlay® compatibility, SafetyTec Group, 360-degree Surround View Camera System, Blind Spot Monitoring & Rear Cross Path Detection, Lane Departure Warning-Plus, premium Nappa Leather-trimmed seats and more. 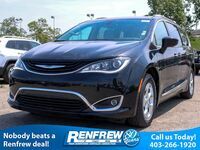 Schedule a test drive of a new 2018 Chrysler Pacifica Hybrid at Renfrew Chrysler! Interested in a Chrysler Pacifica Hybrid?